Join the discussion on our forums! 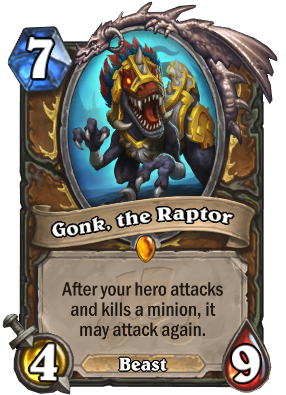 Come discuss Gonk, the Raptor over in our dedicated Gonk, the Raptor discussion topic. Can be a great card if druid is able to have consistently high attack damage. This was my free legendary. I instadusted him. Ah, I see you are a fellow Gonkee too. Toast just confirmed via experiment that haaving multiple Gonk on the field will stack. In other words: if you have Gonk twice and kill a minion you will have TWO extra attacks. Which means a realistic combo would be dscount Gonk or Floop via Dreampetal Florist. Then you play both of them and buff your attack via Malfurion Hero power, Pounce and Claw and get to at least 9attack (regardless of who as discounted). If you kill at least 3 minions you already have a 36 damage combo. Essentially you have an OTk that's reliant on your opponent filling the board and having enough health to clear it. Obviously this is inferior in every way to what we currently have (Malygos essentially does the same with less variables), but it might be good enough to work next year considering we have a way to tutor for beasts. Unfortunately we don'T have a way to flood the opponents board with minions....yet. Honestly it could work if violet illusionist was a card in standard, but as I understand wild has way more powerful thing than that combo, so eh. Personally my fav. loa after the mage one because of the meme potential it holds. If you play 2 Gonk's they stack up the extra attacks. That means if you kill 5 minions with 2 Gonk's you can attack face 5 times, proved by Toast. You are right. Thank you for fixing it! I ve just realized that 'it' refers to your Hero and not to Gonk itself... now this changes quite EVERYTHING! Iksar just said it used to be 5 mana until it was tested with Twig of the World Tree. Guess that explains why it's so bad. Was expecting a card like "give your hero +1 permanent attack" or something. Disappointed. So hopefully this new archetype will get the support it needs next expansion. A new Druid hero card with a hero power that buffs his attack would help. Maybe lower cost, 5-6 mana. An attack based hero power would be a bit stale since that's what the DK's was but....better that then abandon an archetype they've already invested in and leave Druid in limbo. A unique battlecry (like Zul'jin's) helps to offset a vanilla hero power. Besides, hero powers shouldn't be so powerful. DK hero powers were an overreach that rotation will finally fix.